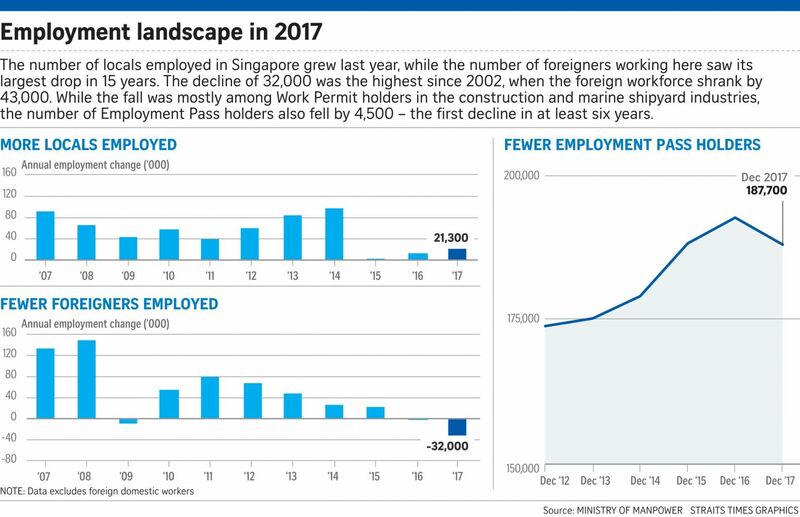 The shifting composition follows a tightening of foreigner hiring rules in Singapore in recent years. For example, the qualifying salary for EP holders was raised to $3,600 a month last year, up from $3,300. This year, it was announced that the qualifying cut-off for semi-skilled foreigners here on S passes will go up from $2,200 to $2,400. To cope, businesses are turning more to locals, said Singapore National Employers Federation executive director Koh Juan Kiat. He said more of its members used government schemes to hire and train local workers in the past year. Recruiters like ManpowerGroup Singapore and Adecco Singapore said they see some companies opting to train their existing workforce instead of hiring new foreign manpower to fill the skills gaps. Some are chafing at the bit, though. Employers have said that they are unable to find locals to fill certain roles, especially in high-tech areas such as artificial intelligence and data analytics. In response, MOM said last week that it exercises some flexibility in assessing EP applications from firms that, among other conditions, plan to develop such skills among locals. The development comes against a backdrop of improving job prospects for locals all round. Overall, the seasonally adjusted unemployment rate dropped a notch, from 2.2 per cent in December 2016 to 2.1 per cent a year later. For Singaporeans, it dropped from 3.4 per cent to 3 per cent, while for Singaporeans and permanent residents combined, it fell from 3.2 per cent to 3 per cent. Long-term unemployment, the proportion of the resident labour force unemployed for at least 25 weeks, remained at 0.8 per cent. MOM said local employment is likely to continue to grow this year, in line with expected economic growth of between 1.5 per cent and 3.5 per cent. But the opportunities will likely be uneven, with more hiring in sectors such as manufacturing, infocomms and media, logistics and wholesale trade, it said. It called on employers to "focus on upgrading jobs and wages through better productivity and job redesign, in order to attract higher-skilled and younger locals", as more older rank-and-file workers will be retiring . After six years of rising retrenchments, fewer workers were laid off last year - an improvement seen in both the local and foreign workforce. But in certain industries, locals, who comprise Singaporeans and permanent residents, were more vulnerable to losing their jobs than foreigners. This was the situation in industries such as infocomm technology (ICT), electronics manufacturing, petroleum products manufacturing and real estate, where the local share of retrenchments was higher than their share of employment. The labour market figures for last year released by the Ministry of Manpower (MOM) yesterday show that overall, locals made up 67 per cent of employed people, excluding maids, last December. As for retrenchments, the total number fell to 14,720 compared with 19,170 in 2016, which was a seven-year high. Among locals, it dropped to 9,120, down from 11,080 in 2016. Economists said some of the industries, where proportionally more locals were asked to go, have undergone restructuring. DBS economist Irvin Seah said many companies now prefer to hire information technology staff on contract, for example. "I don't think it is due to any particular discrimination against locals in these sectors," he added. In terms of occupational groups, local professionals, managers, executives and technicians continued to form the bulk of those laid off. Their share of retrenchments has grown at a faster rate over the last decade than their share of the resident workforce. Last year, they made up 72 per cent of those laid off, while they comprised 57 per cent of residents in employment. In particular, they were mainly retrenched from service industries such as financial services, wholesale trade and professional services, said the MOM report. National Trades Union Congress assistant secretary-general Patrick Tay said the reason could be that these three industries see heavy churning in terms of job losses and job gains owing to digital disruption and automation, though overall job opportunities there are growing. Banks also underwent rationalisation and relooked their strategies, which affected the finance sector, noted Mr Tay, who chairs the Government Parliamentary Committee for Manpower. His advice: "Workers should look at developing the in-demand skills for in-demand jobs in the sector. They can also look for opportunities outside the sector in adjacent industries where the skills needed are similar to those they have." On the bright side, most retrenched residents found new jobs within six months. This rate of re-entry into employment was about 65 per cent, similar to the rate in 2016, although older workers and degree holders had lower rates. Another plus for jobseekers is that the ratio of vacancies to unemployed people rose to 0.92 in December, after taking into account seasonal variations. The rate was 0.77 a year earlier. Economists said this shows the labour market is tightening again, which means employers face stiffer competition for workers and hopefully, it will result in better wage growth this year. "It is a happy outcome for workers, but not so for businesses," said UOB economist Francis Tan, who cautioned that if employers cannot get enough talent, whether local or foreign, Singapore may miss out on the opportunity to ride on the upcycle of economic growth this year.